Demong Wins First U.S. Gold in Nordic Combined or Nordic Anything!!! Superb, strong skiing and thoughtful tactical planning allowed Vermontville native Billy Demong to win his and the United States' first Olympic gold medal in nordic combined skiing. Teammate Johnny Spillane was right behind Billy to claim the silver. Bill's medal is the first gold medal ever won by an American in any nordic competition. Wow. Way to go Billy - congratulations!! 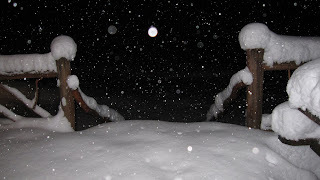 Here is a quick Adirondack Lifestyle snow and ski report - it is snowing out like crazy - yippee! It appears we are back to normal winter in Lake Placid. This evening's cross-country ski excursion at the Olympic trails was a workout indeed. The snow is falling fast and heavy, just like it is supposed to be doing this time of year. Breaking trail through the rapidly accumulating sweet stuff was a pleasant hardship, and one I am ready to endure again tomorrow if necessary. We have received 18+ inches of snow in the last 36 hours and as tonight's featured photo illustrates, it is still coming down! Check back tomorrow for a more detailed and a less exuberant report. Actually I can't promise less exuberance, but I can promise more details.